Caelan Richard Atamanchuk was an outstanding student and athlete, and contributed significantly to his community. 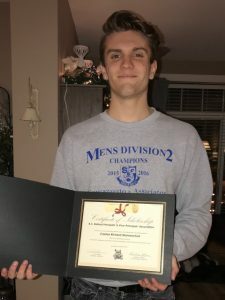 He achieved a 4.0 GPA, a 95% average and the Top Academic, Student Top All Around Student and Top Academic Ahlete awards at Norkam Senior Secondary School. Caelen was a part of Student Voice, Norkam Alumni Fund, Model United Nation and Chair of the Grad Committee. Outside of school, Caelan played soccer and was often named team captain, because of his leadership and mentorship skills. He also coached younger aged teams with the Kamloops Youth Soccer Association. During the summer of 2017, Caelen volunteered with the four Paws Food Bank Emergency Shelter for pets when wild fires spread across the Okanagan. He volunteered hundreds of hours that summer assisting the community during a stressful situation. Caelan is currently pursuing a Bachelor of Science in Physics at the University of British Columbia, Okanagan campus. He hopes to earn a Doctorate Degree in Physics. Congratulations Caelan on receiving the BCPVPA Scholarship and all the best in your future endeavors! In 2015 Emily founded the Miracle Movement which has raised thousands of dollars for Children’s Hospital. She has also played an integral part in Project Pulse as part of the founding team. 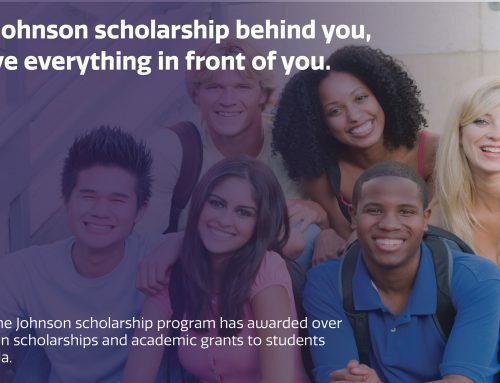 This Project connects students with professionals in the healthcare industry. She has been involved in so many areas which help others that she was acknowledged at WE Day in 2017 for her “efforts as a passionate community leader and changemaker.” At the school level she was chosen to be the leader of Best Buddies, the school’s largest student-run leadership club. The list goes on and at university she has accepted a leadership position in UNICEF SFU, the largest humanitarian club on campus. She plans to volunteer for the Kids’ Help Line when she turns nineteen. At high school she managed to keep a straight ‘A’ average and graduated with 132 credits of study. Hailing from Bowser, BC, Jensen’s career goal is to become a Marine Biologist, thereby participating in research and conservation to learn about and protect the world’s oceans. To this end, she volunteered for four years at the Deep Bay Marine Centre. 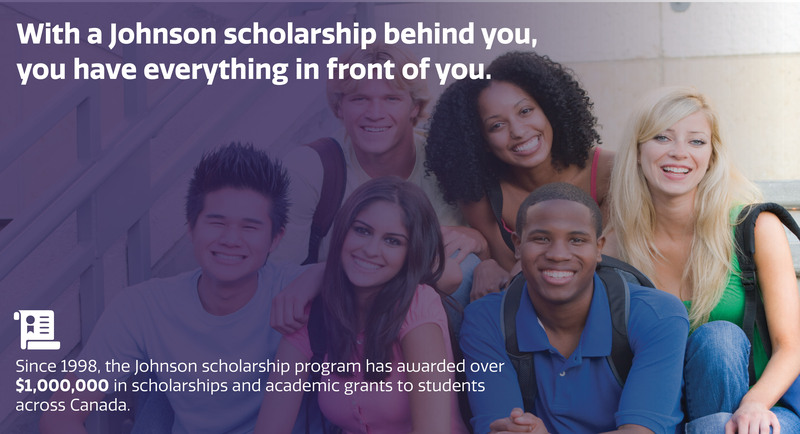 Her goal aside, Jensen volunteered extensively at the school and community levels. She competed in the Model United Nations; was an active member of Student Government; a band member; and a participant in school athletics. Her Vice-Principal refers to her as “one of the best people I know” with “ a commitment to task and an excellence uncommon in many people her age” and as “a true Renaissance person”. A Community Organization seconds these opinions and talks of her dedication and maturity. In addition she has volunteered as a teen mentor for Big Brothers Big Sisters and at the MARS Screech Owl Project. While volunteering so much of her time, Jensen maintained an ‘A’ average. With someone like Jensen whose contributions at the school and community levels have been invaluable, we look forward to her contributions in the future as she begins her studies at Dalhousie University in NS’ one of the only schools in Canada to offer a program in Marine Biology. Kurtis James Li was an outstanding student, musician, athlete and leader from Burnaby South Secondary School. 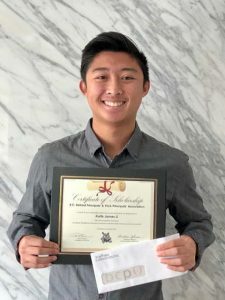 He achieved a 4.0 GPA and received the Top English Language Art’s Award, the Top French Language Award, the Top Jazz Band Award and Outstanding Academic Achievement Award in addition to the Male Athlete of the Year Award. 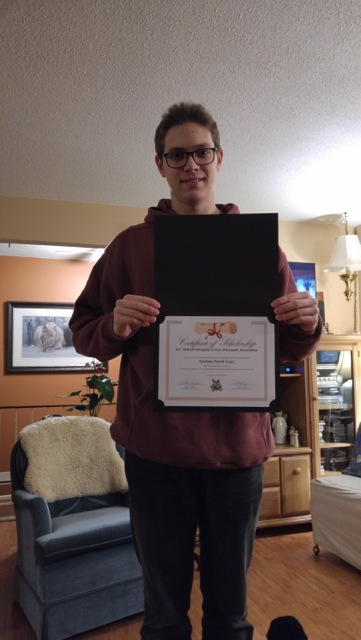 Notably, Kurtis worked with other students to create an educational mobile application for the BC Ministry of Education. He presented the application at the Innovation Partnership Forum (2015) and the Ignite Innovation BC Conference (2016). Kurtis’ references have praised him for being a well-rounded student and leader. They highlighted his work coaching soccer and swimming teams at Burnaby South and in his community, and volunteering as a first-aid attendant and IT support worker. Kurtis is currently pursuing a Bachelor of Applied Science Degree in Mechanical Engineering at the University of British Columbia. 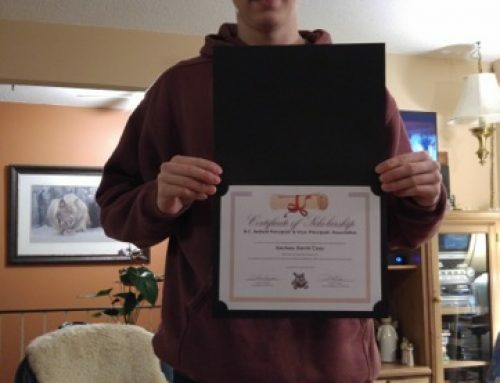 Congratulations Kurtis on receiving the BCPVPA Scholarship and all the best in your future endeavors! Sarah Alisha Kedves was a leader, excellent student and high performance athlete. 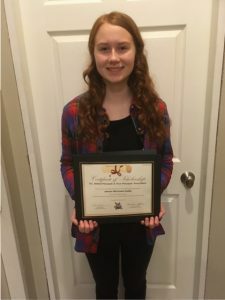 She took a very demanding course load at South Island District Education & Canadian Sport School, including three Camuson College courses, and achieved a 4.0 GPA and 97% average. 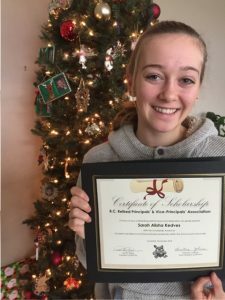 In addition to her academic excellence, Sarah has excelled in athletics; she competed in figure skating at the national level, and track and field at the international level. Sarah has also significantly contributed to her community. She volunteered hundreds of hours to the BC Special Olympics, Skate Canada, the International Coaching School, and coaching at the local skating club and track and field meets. In a very stressful athletic environment, Sarah has consistently been able to find a balance for excellence in academics, athletics and service for others in the community. Sarah is currently pursuing a Bachelor of Science in Kinesiology at the University of Victoria. Congratulations Sarah on receiving the BCPVPA Scholarship and all the best in your future endeavors!